Q. Where do I find information to complete a SWOT analysis? You can find detailed information about the SWOT analysis and finding the data to complete one in our SWOT LibGuide. A SWOT analysis is an analysis of the internal and external environment of a company, organization, or nonprofit. SWOT analyses are used to create strategic business plans. External environmental factors are typically considered to either be Opportunities or Threats, whereas Internal factors are generally classified as Strengths or Weaknesses. 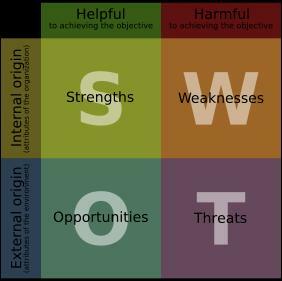 The four factors together (Strength + Weaknesses + Opportunities + Threats) make up a SWOT analysis. To find information for a SWOT, you will want to analyze articles, data, financial reports and surveys from a variety of credible sources.﻿ Review the tabs in the SWOT LibGuide to see what to find, and where to find it, for each of the different areas of your SWOT analysis. INTERNAL ANALYSIS: Your internal analysis must include factors within your organization that might be considered a strength or weakness relative to your competition and could be leveraged to take advantage of strengths and/or opportunities or fix/reduce weaknesses and mitigate threats. Specifically, you must analyze the strengths and weaknesses of each of the functions found in your organization (i.e. Sales & Marketing, Finance & Accounting, Management (including HR), Research & Development, Production, and Information Systems. You are to assess how well these functions are performing, providing an in-depth discussion and analysis of resource levels and capabilities (how well these functions are using the resources to achieve organizational objectives). Do not simply describe how your organizational units perform their work. EXTERNAL ANALYSIS: Your external analysis must include factors outside your organization that may pose opportunities or threats to your organization. Specifically, you must analyze factors in the societal environment (demographics, economic, socio-cultural, political-legal, and technology) as well as factors in the industry environment (customers, competitors, and suppliers). Do not simply describe the external factors that you believe affect your business. You are required to provide the reader a clear understanding of how the factors are related to the creation of opportunities or threats for your organization.